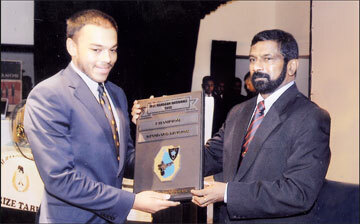 Lieutenant Yoshitha Rajapaksa of the SL Navy who won the IPSC President's Medal for the standard division and winner of the individual overall category receiving his award from Navy Commander Vice Admiral Jayanath Colombage. Lieutenant Yoshitha Rajapaksa of the Sri Lanka Navy won the International Practical Shooting Confederation (IPSC) President's Medal for the Standard Division and became the winner in the individual overall category (Standard Division) at the National Handgun Championship – 2012 conducted by the National Rifle Association of Sri Lanka at the Navy firing range in Welisara from November 11 to 13. Fourteen renowned shooting clubs in the island including Tri-Forces and Police competed for the honours, showing exceptional talents in the sport discipline which requires talent, dedication, commitment and patience combined with ability to shoot rapidly and accurately utilizing one's expertise training to the maximum. The marksmanship and shooting skills, which were on display throughout the competition, made the event a memorable one true to the motto of the International Practical Shooting Confederation, “Diligentia, Vis Celeritas” (Accuracy, Power, Speed). In addition, SL Navy were able to win the third place in the Ladies Teams Category (Open Division), the first places in the Teams Overall Category (Standard and Open Divisions), the first place in the Man vs Man Category (Standard Division), the first and second places in the Ladies Category (Standard Division), the second place in the Ladies Category (Open Division), the first, second and thirrd places in the Individual Category (Standard Division) and the third Place in the Individual Category (Production Division). Commander of the Sri Lanka Navy, Vice Admiral Jayanath Colombage graced the awards ceremony as the chief guest and gave away the certificates and medals to the winners.